We like to believe that life is unpredictable, but more often than not we’ve chosen to ignore warning signs. 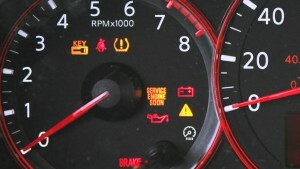 Those dashboard lights are called idiot lights for a reason – they’re impossible to miss. Life comes with idiot lights too, but for some reason we very often choose to ignore them. And the more we choose to ignore them, the more difficult and unpredictable life becomes. Most people ignore these things until them become urgent problems, and sometimes very serious ones. And that’s when most people address problems – when they ‘have to’, when they’ve become a hardship or obstacle. If you learn to take action on small things now, life gets easy. Now, of course this doesn’t mean you run to the emergency room for every minor cramp, or quit your job and write a novel the moment an idea crosses your mind. And sometimes it can be smarter to wait. For example, it can be more efficient to cluster tasks together, or advantageous to allow time to let things to mature in our mind, or even resolve themselves. Those are smart strategies, but they’re not usually the first choice and they’re certainly not helpful without a general shift in mindset – a forward-leaning stance, biased toward immediate action instead of delay. We’re bad at action. We’re amazing at procrastination. The shift is not easy. It takes some effort to learn to break free from procrastination, and to start leaning forward into life instead of ignoring warning signs and continuing to put things off until later. But, the rewards for this effort and learning this skill are exponential. Even a little shift; paying bills on time, resolving minor maintenance or health issues, or correcting errors at work can pay off tremendously. Even small shifts in our stance from ‘putting things off’ to ‘doing them now’ makes a huge difference in daily life, across the whole spectrum of important things – money, work/career, health, relationships, and overall happiness. Think about a setback or problem that you’ve dealt with in the last few years. If you’re honest, you’ll probably admit there was a sign early on that things were not going the right way. Maybe it was a weird noise with the car, a leak in the house, a poor result at work, or a manual you were too busy (solving more unpredictable and urgent problems?) to read. Perhaps it was an email you didn’t bother to write, or a physical symptom you ignored. And it could have even been a ‘gut feeling’ which is often just your subconscious trying to remind you that you’re making an error somewhere and you should pay attention. Successful people don’t ignore warnings, even the really small ones. Successful people pause and ask probing questions, like “I wonder if this is a symptom of a bigger problem” or “Can I take any action here to prevent an issue from arising?”, and most importantly “What is this telling me?”. This is a skill to learn, and successful people hone it to a craft. They spend much of their time taking action solving small issues on their own terms, so that they can avoid being at the whim of unpredictable big problems all day long. Lean forward, pay attention to warning signs and take action early, and you’ll watch your life calm, and obediently gather under your feet.